The simplest way to show your people they matter is to gather at the table over a yummy meal. But do you ever feel like you’re in a dinner rut? I know I do. Don’t get me wrong, I love “Taco Night” but sometimes you just gotta shake things up. Serve something a bit more unexpected, and, dare I say, exotique! The gingery scent of this dish sizzling on the stove top is intoxicating! So, skip the Asian take-out and delight your people with this healthy and hearty all-in-one meal. That means “Delicious!” in Japanese, y’all! Whisk soy sauce, sugar, vinegar, ginger, pepper flakes, and cornstarch together in a bowl. Pat steak dry with paper towels. Heat 1 tablespoon oil in 12-inch nonstick skillet over medium-high heat until just smoking. Cook steak, turning as needed, until well browned on both sides and meat registers 120-125 degrees (for medium-rare), 8-12 minutes. Transfer to cutting board and tent with aluminum foil. 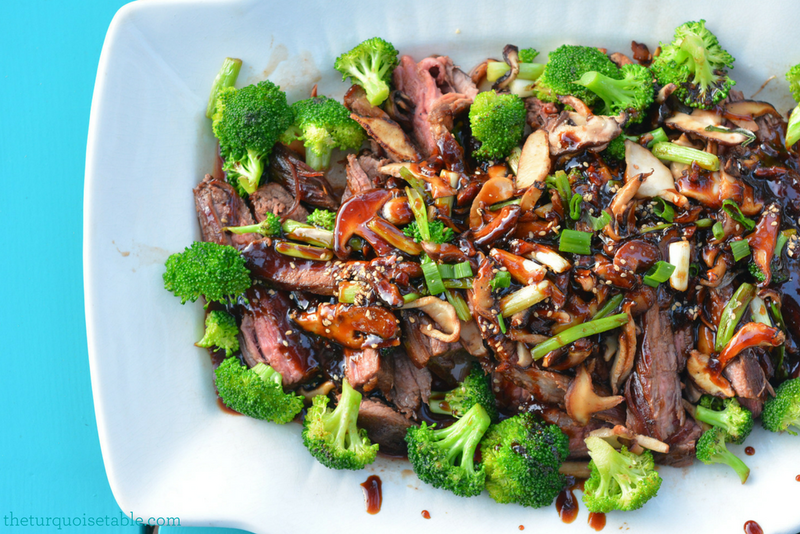 Add remaining 1 tablespoon oil and scallions, mushrooms, and broccoli to skillet and cook over medium heat until lightly browned, 2-3 minutes; transfer to bowl. Add soy sauce mixture and any accumulated meat juices to skillet and simmer until thickened, 2-3 minutes. Slice steak thinly on bias against grain. Transfer to platter and top with sauce, scallions, and sesame seeds. Serve.